I am a huge, huge fan of Leo and Diane Dillon's artwork, so I was excited to see that they were releasing a new book this year. The text actually originates from Marjorie Kinnan Rawlings 1956 Newbery Honor winning book. I wasn't sure how I felt about the fact that the text is abridged... but then much like when Rachel Field's 1930 Newbery winner, Hitty: Her First Hundred Years was abridged by Rosemary Wells and Susan Jeffers amidst much controversy a few years ago, I figured, well, why not? If it brings a forgotten classic to a new generation of readers, that can't be a bad thing, right? While The Secret River is in a picture book format, it's roots as a chapter book are evident in wordy pages with expressive language appropriate for second to fifth grade readers. "There is a dark forest far away in Florida," the story begins. Young Calpurnia lives there with her parents and pet dog named Buggy-horse. "At breakfast Calpurnia's father said, 'Hard times have come to the forest.' She said, 'What are hard times?' 'It means that everything is hard, and especially for poor people. She felt the table, she laid her hand on Buggy-horse's hard back and it was true: Everything seemed harder than usual. She asked, 'Are we poor people? I don't feel poor." Worried that her father won't be able to sell fish at the market, Calpurnia makes pretty pink paper roses to bring to Mother Albirtha, who advises her to go to a secret river. Sure enough, Calpurnia finds it, and catches an absurd bounty of fish. Traveling home, she is accosted by an owl, a bear and a panther who each demand their share of the fish. Even though her supply of fish is now greatly reduced, Calpurnia doesn't forget her promise to Mother Albirtha, and brings her a fish as well, prompting Albirtha to exclaim, "Oh my goodness to the may-haw bush. Oh my goodness to the swamp maple." She gives the rest of the fish to her father to sell to hungry people, "And so hard times in the forest turned to soft times." 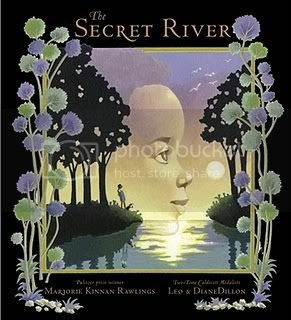 The Secret River has the cadence and feel of a long-forgotten fairy tale - the brave young girl with a soul of a poet, a magical solution for hard times, the repeating refrains, and incidents grouped in threes. The paintings are luminous. Endpapers feature two-tone catfish line drawings. This book is a must have, especially for audiences hungry for stories featuring African-American characters who are not dealing with antebellum or civil rights issues. During these tight financial times, Calpurnia's adventures may especially resonate with readers. The Dillons have successfully breathed new life into what is a timely and welcome return of an old classic. I highly recommend this book. Wonderful review. I love the Dillons' work, and the illustrations in this book are just luminous, turning the text into poetry. I desperately want it for my personal library. I just brought home a whole slew of Dillon-illustrated books from the library to read to my girls. ("The Secret River" has a long wait.) "Wind Child" was the first one we read, written by Shirley Rousseau Murphy and illustrated by the Dillons. Earth Mother is one of my favorites. I love the art in that one.